Cheesy garlic zucchini bread is a recipe I often make when summer squash are abundant, but it also works just fine with frozen shredded squash. It's a quick bread recipe, not a yeast bread, so it goes together in a flash. The texture is nice and moist, and the garlic gives it real “pop”. 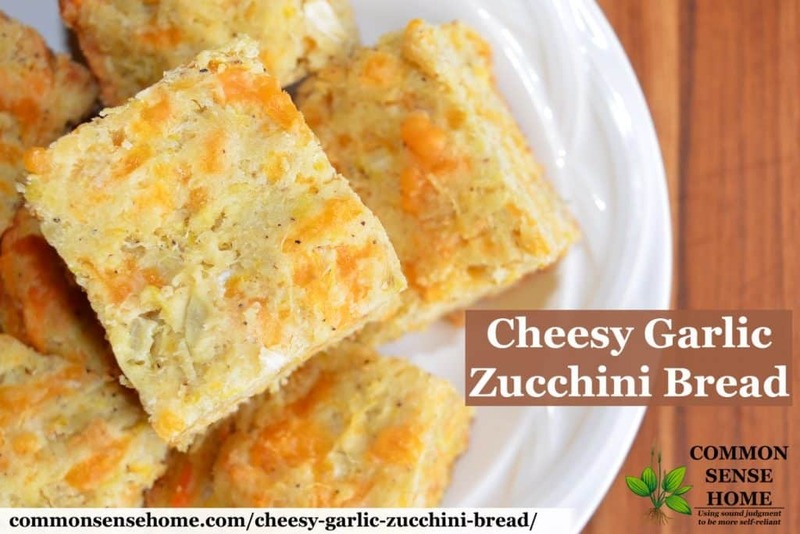 This recipe is adapted from the Zucchini Cheese Square recipe in The Garden-Fresh Vegetable Cookbook. You can use whatever size zucchini you have available. I remove the seeds from overgrown zucchini and sometimes peel them, but I don't peel or remove seeds from the younger ones. Combine the zucchini and salt in a colander and toss to mix. Set aside to drain for 30 minutes. Squeeze out the excess water. Stir together the flour and baking powder in a medium bowl. Add the onion, zucchini, cheese, garlic powder and pepper. Mix well with a fork, breaking up any clumps of zucchini. Whisk together eggs and butter in a small bowl. Pour into the zucchini mixture and mix well. Spread evenly in the baking dish. Bake for about 35 minutes, until golden. You want the whole top golden and the entire pan cooked through, so don't be afraid to give it some extra time if needed. The batter is very thick and moist. Let cool on a wire rack for 5 minutes. Cut into squares and serve warm or at room temperature. Store leftovers (if there are any) in the refrigerator. Note: I've experimented with using gluten free flour (Namaste Gluten Free Flour Blend), and while the flavor is good, the bread tends to take much longer to bake and be heavier. 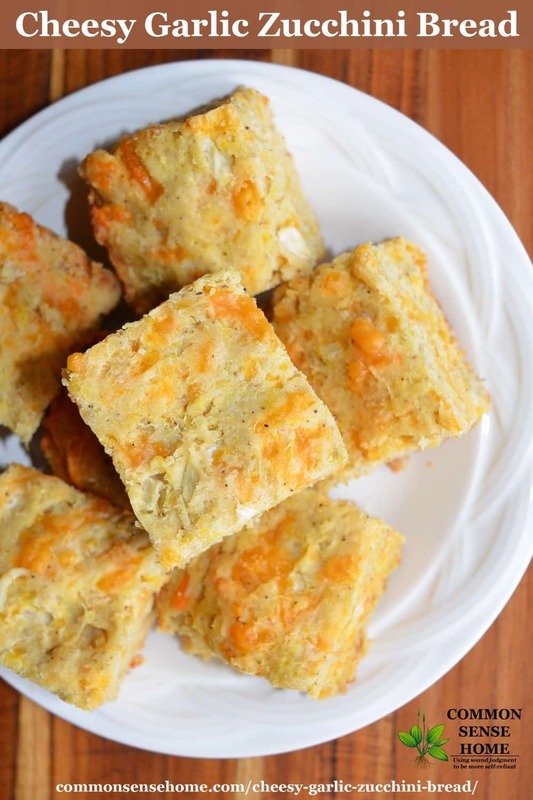 A savory quick bread recipe with garlic, onions and zucchini. Bake for about 35 minutes, until golden. You want the whole top golden and the entire pan cooked through, so don’t be afraid to give it some extra time if needed. The batter is very thick and moist. And that's it – yet another way to use up some summer squash. This goes well as a side dish with grilled food and cold salad. Mmmmmmmmmm. This is a keeper! Yum – this looks really good, I can’t wait to try it! I agree this looks amazing! Thanks for sharing! THIS is amazing. My mother in law has made it several times and I am making it tonight. Thanks for the feast! Just made this with squash and zucchini from my garden. It was delicious!!! Definitely a keeper. Thanks for the recipe! Kayli – glad you enjoyed it. It works well with frozen (thawed) zucchini, too. How would I adjust the time and temperature if using a loaf pan? Joy of Baking has some good conversion tips for different pan sizes. This was excellent! I used spelt flour and it turned out great. Also, I was lazy and skipped the step of salting and draining the zucchini – and I didn’t see that it made a difference? I just skipped it because I was in a hurry and I’ve never done that for Zucchini Bread in a loaf. Fantastic! I bet it would be good split, and used as a “foccacia” style bread. Does this freeze well in vacuum seal bags? I haven’t tried it, but I would think that it would. I’m slowly working on updating older posts to include an easier to print recipe card, but it takes time. Right now you can use the Print Friendly button at the lower left of the article, or cut and paste into a word processing program. Very yummy! I’ve made these before in the 7 x 11 recommended, but today I made them in a muffin pan. They turned out much crispier, in a good way. FYI they only take about 25 minutes in the muffin pan. Muffins and cupcakes are a great way to cut down cooking time in hot weather. Good idea! I’ve just started using Quinoa flour and find it makes amazingly light muffins, so shall substitute in this recipe. If you have time, stop back and let me know how it goes. Could you do in a cast iron skillet (a la cornbread)? If so, what modifications would you make to time and/or temp? I don’t see why you couldn’t, though I’ve never tried it. Cooking times should be similar. Loved it! Added tomatoes, lots fresh herbs and jalapeno, delicious! Am making it again today!